IMaR currently has an opening for a Gateway Manager. Work closely with the IMaR research team to develop opportunities for IMaR by locating, developing, defining, negotiating, and closing business relationships with IMaR Technology Gateway Industrial clients. While an honours bachelor’s degree in a Science or Engineering discipline is a minimum requirement, a masters or PhD is desirable. An ability to conceptualise and facilitate the development of commercial applications for research. Experience of working on industry focused innovative projects and the ability to translate the IMaR Gateways technical skills into a technology offer that can deliver innovative solutions for industry partners. Extensive knowledge of current and emerging trends in technologies, techniques and approaches in mechatronics; RFID; scientific papers, patents and market intelligence on same. A salary of up to €67,720 p.a. will apply to this post depending on qualifications and experience. It is anticipated that interviews will be held on Thursday 8th October 2015. 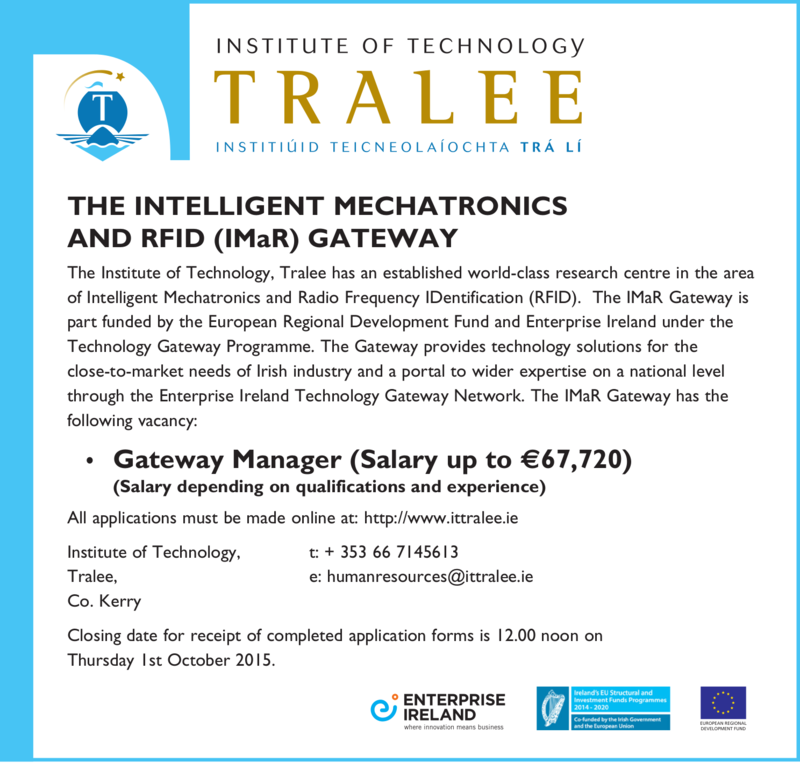 This post is located at IMaR in the Institute of Technology, Tralee however travel will be required to collaborate with Industrial and Academic Partners in the development of research activity.